A compact, programmable DC speed control with digital closed loop feedback and LED display for DC motors rated to 2 horsepower. An on-board microprocessor with non-volatile memory, coupled with sophisticated internal software, makes Dart’s Micro-Drive the ultimate value in accuracy and control. Friendly front-panel field programming permits customizing the MD for specific applications. The MD can be set to display the target speed directly in RPM, FPM, GPM, process time, or any other engineering unit. Programmable parameters include maximum and minimum set speed, decimal points, operating mode (master or follower), and the constant which takes into account motor gear ratios. 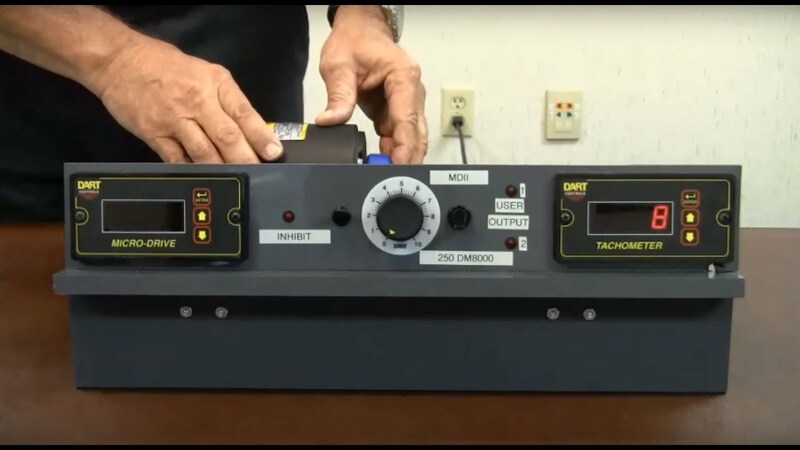 The Micro-Drive is simple to operate: set the desired RPM, rate, or time in the large 1/2″ LED display by depressing the “Up” and “Down” push buttons on the front panel. Settings can be one digit at a time or fast sweep. The Micro-Drive settings are exact and repeatable. It will precisely control speed to ±1/2 RPM of set speed, long term. No calibrations of the control are necessary. Industry standard cutout dimensions of 1/8 DIN and 1/4 DIN provide easy panel installation. All wiring connects directly to a rugged screw type terminal strip through the rear panel. The flexibility of Dart’s Micro-Drive design makes it uniquely suited for many commercial and industrial applications. The Dart Model PU-40E / PU-40R is recommended for use with these models where pickup is turning 2500 RPM or less.